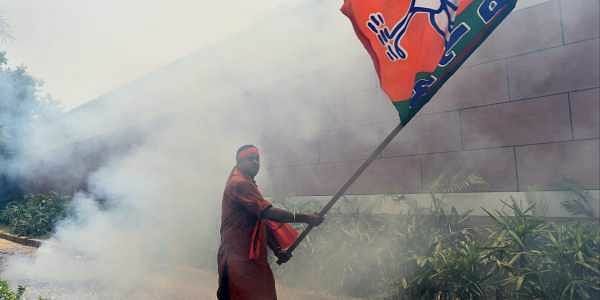 After the Gorakhpur and Phulpur bypolls in Uttar Pradesh in March last and in Kairana in UP and Bhandara Gondiya in Maharashtra in May now - where the opposition parties had united against the Bharatiya Janata Party — many have almost prophesied the defeat of the BJP in 2019. And the opposition has just about assumed it will be in power by then. This prophecy and assumption rest, one, on the arithmetic of the votes in 2014 Lok Sabha polls and in the LS bypolls in 2018; and two, on the hope that the divided opposition parties’ votes will automatically get aggregated when they unite for the LS poll in 2019. The validity of the arithmetical tests and assumption of automatic aggregation of votes need scrutiny. Take Uttar Pradesh, which will be the main battleground in 2019, like it has always been. The reason why the BSP and the SP strategically got together in March 2018 was that the BJP got far less votes than the divided opposition in 2017, but swept the UP Assembly poll. In the five Assembly segments of the Gorakhpur LS seat, the BJP polled just 40.5% votes in 2017 and the divided opposition 55.3% — almost 10% more. And yet the BJP won all the Assembly seats. Likewise in the Assembly segments of Phulpur LS seat, the BJP polled just 34.8% votes and the divided opposition 58.7% - almost 24% more, but BJP won four of the five seats. And more. The SP and the BSP, which together polled 10% more votes than the BJP, got none. This, and not 2014 LS poll, triggered Mayawati to make common cause with her arch enemy, the SP. Even though the overt message of the numeric of the 2014 LS poll and 2018 bypoll is that the BJP would face an uphill task in 2019, the hidden message — concealed in the maze of figures of the 2017 Assembly poll and the 2018 LS bypoll — clearly seems to point the other way. What is the hidden message? In the 2017 Assembly polls in Gorakhpur, the aggregated votes polled by the divided opposition over the BJP was 15%. But, in the March 2018 LS bypoll, within 12 months, the BJP’s share rose by 6.5% and the share of the united opposition dropped by almost an equal number as compared to the votes the divided opposition got in 2017. In fact, when the opposition merely loses one vote, it is just a loss of a vote. But when it loses that vote to the BJP, the margin between them gets reduced not by one, but by two votes. That is what happened in Gorakhpur. The divided opposition led by a margin of 14.8% over the BJP in the 2017 elections. By a 6% shift of votes from the opposition to the BJP, the margin got reduced by 12.2% to 2.4% in 2018. If the BJP can pluck another 1.5% votes from the opposition, it will win Gorakhpur. In Phulpur too, the divided opposition together got almost 24% more votes than the BJP in the 2017 Assembly polls. But in the LS bypoll in March 2018, the lead of 24% of the united opposition over the BJP in 2017 dropped to just 8%. The BJP, which has reduced the lead margin by 16%, needs to pluck another 4% votes from the opposition to win Phulpur. Almost the same story was repeated in May in the LS bypoll in Kairana. In the 2017 Assembly elections, in the five Kairana Assembly segments, the divided opposition polled 57.4% and the BJP 38.2% - almost 20% less. And yet the BJP won four seats, while the SP got just one. In the LS bypoll in May 2018, the BJP’s vote share jumped by more than 8.6% to 46.8% as compared to 2017. The united opposition got 49.4%, less 6% as compared to 2017. As a result, the BJP made a huge 15% cut into the opposition margin, reducing it from 19.2% in 2017 to just 4.7% in 2018. Now the BJP needs to pluck another 2.5% votes from the opposition to win Kairana. Let’s now move to the Nurpur Assembly bypoll in 2018. In 2017, the divided opposition had a 17.4% margin over the BJP in Nurpur and yet because of the vote split, the BJP won the seat. In the 2018 bypoll in Nurpur, the united opposition won, but its share went down while the BJP’s went up, bringing down the divided opposition’s lead over the BJP in 2017 from 17.4% to just 3% in 2018. The BJP needs to pluck only 1.5% more votes from the opposition to win Nurpur. Clearly, the BJP has recouped in 2018 what it had lost in 2017 when compared to 2014. As compared to the 2017 Assembly polls, in the 2018 LS bypoll, the BJP has reduced the united opposition’s margin in Gorakhpur from 14.8% to 2.4%. In Phulpur from 24% to 8%. In Kairana from 19.2% to 4.7%. It needs to cut the opposition votes by 1.5% in Gorakhpur. By 4% in Phulpur. And by 2.5% in Kairana. In Nurpur Assembly by 1.5%. Possible? Seems so. And comfortably. It can happen in two ways. One, a significant section of the electorate prefers a national party in the LS poll and local parties in Assembly polls, because it roots for a stable Central government. This preference had for long worked in favour of the Congress. Now it works for the BJP. This is evident from the fact that those who had voted for SP, BSP, RLD in the 2017 UP Assembly in 2017 had rooted for the BJP in the 2014 LS poll and later in the 2018 LS bypoll. Actually the reason for the fall in BJP share of votes in Assembly polls in 2017 seems to be the shift by those who prefer a national party in the LS poll over regional parties in Assembly polls. Two, the BJP is likely to get substantial votes in regular LS polls from those who kept off the polling booths in the LS bypoll in 2018. For, those who keep off the bypoll are generally the middle class and upper class voters over whom the BJP has considerable hold. The polling in Gorakhpur was less by over 13%, compared to 2014 and by 11%, compared to 2017. Here, the BJP, which has already reduced the 2017 opposition lead by 14.8% in 2018, needs to get 2.4% more votes. In Phulpur, 13% voters had kept off the polls in 2018, compared to 2014; and 14.2% had kept off the polls as compared to 2017. Here the BJP, which has reduced the opposition’s 2017 lead by 16% in 2018, needs 8% more votes. In Kairana, 15% voters had kept off the polls in 2018, compared to 2014 and 13% compared to 2017. Here the BJP needs 4.7% votes. In both ways, the BJP, which has already shown a huge capacity to pluck opposition votes in the LS poll, may comfortably be able to achieve a further rise in its share of votes over 2018. If UP’s message is hidden behind a maze of numbers, the message from Maharashtra is fairly direct. In the Palghar parliamentary poll in May 2014, the BJP and the Shiv Sena stood together and the BJP won with 54% votes. In the Assembly poll in December in the same year, they fought each other. With neither the Congress nor the Nationalist Congress Party in the fray, the Bahujan Vikas Agadi (BVA), a local party, contested and got some 30% votes. In the 2014 Assembly polls, the BJP got 21.4% votes while the Shiv Sena notched up 21%; the NCP and the Congress 15%; and the BVA got the maximum 32.6%. In the 2018 LS bypoll, the BJP and the Shiv Sena fought against each other. The BJP won with 30.8% votes and Shiv Sena got 27.4%, BVA 25%, and the Congress supported by the NCP lost its deposit. In the Bhandara Gondiya LS poll in 2014, the BJP supported by the Shiv Sena won with 50.6% votes while the NCP got 38%. In the 2014 Assembly polls, the BJP and the Shiv Sena fought each other. The BJP got 34.5% votes, the Shiv Sena 10.5%, Congress+NCP+BSP got 44% but because of vote split the BJP pocketed four of the five Assembly seats while the Congress got one. In the 2018 LS bypoll, the NCP supported by the Congress and the BSP won with 46.6% votes and the BJP with 41.5% came second. Obviously, the Shiv Sena did not fully vote for the BJP. But from the 2019 perspective, the Shiv Sena has no option but to ally with the BJP. If they both ally, the Congress- NCP led opposition’s fate would be sealed, like in 2014. The message from Maharashtra is fairly plain. To conclude, there are three hidden messages particularly in the UP arithmetic. The first is that when the opposition unites, its votes do not just get aggregated automatically; it actually loses part of its own individual constituents’ votes. The second, a section of voters seem to prefer national parties for the LS poll and local parties for the Assembly polls. In 2018, the BJP has been able to pluck the votes the opposition polled in the 2017 Assembly elections. The third message is that as in the bypolls, a section of the middle and upper middle and educated voters, most of whom may prefer the BJP, do not vote, the party’s share in the bypoll will be relatively less as compared to the regular poll. And more. Three most important, explicit drives of the 2019 need to be factored into the analysis. One, Modi’s stature and leadership for the BJP and its allies and the absence of a leader for the crowd, that is the opposition. Two, Modi’s agenda of development vs the opposition’s agenda of defeating Modi will make the elections a replay the 1971 LS poll of Garibhi hatao vs Indira hatao — which will be disastrous for the opposition. Three, Modi’s people connect and oration and the total lack of it on the opposition side. Opposition strategists needs to think more deeply than just look at superficial arithmetic. clean and nice analysis.The NDA has to encash it.Any amount of negative and hate propganda willnot affect the NDA.If the opposition tries to divide using cast and religin a powerful propogand is needed which the BJP is capable inview of their organisational strengh and disciplene.Provocative statements by some immature persons are to tobe controlled by proper guidance and councelling. Guru sir you may write something with some arithmetic which is not convincing me and it is based on number of assumptions deliberately favouring BJP. But in real sense I am telling you BJP is going to lose 2019 battle. This is very clear. Well analysed by S.G. in LS polls unlike TN and south states North prefers national party and decisive leadership. Pappu being pappu for ever will have to beg Maya and others for seats.